Hosting a dinner party for family and friends is one of life’s great highlights. It’s an excuse to slow down from the busyness of life’s rush and enjoy good company over a delicious meal. But, as every veteran host or hostess knows, some food on a table does not make a dinner party. A truly spectacular meal – whether it be a grand late morning breakfast, a more formal Sunday lunch or a special occasion dinner – requires a beautiful table setting. Something which continues to confuse even the most experienced of dinner party hosts and guests is the various table settings which exist for different meals. 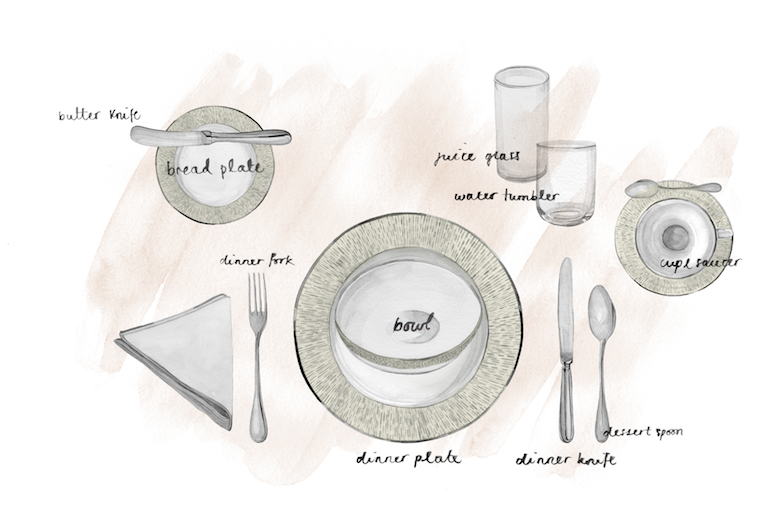 Stick to this handy guide and discover how to set a table for a fuss-free experience. 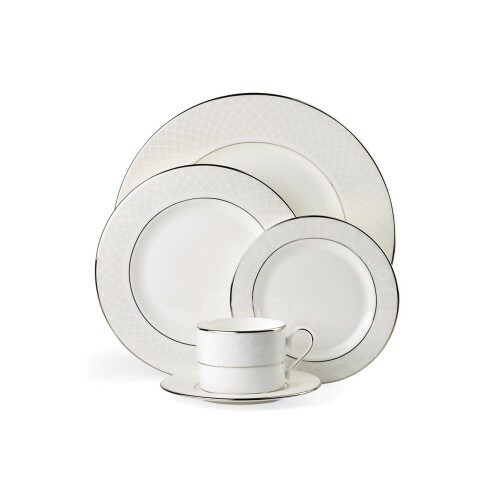 – Make sure the base of any vertical silverware always aligns with the bottom rim of your plate. 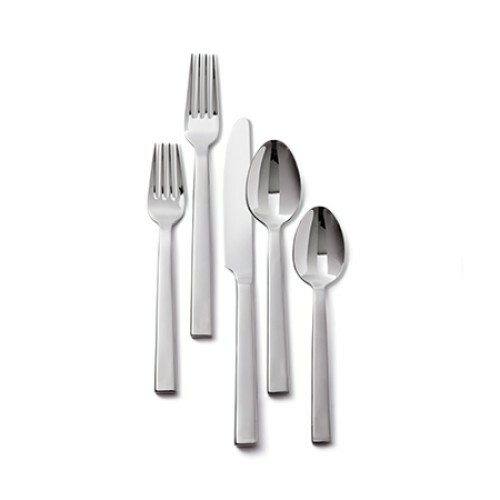 – Always place knives with the blade facing inward on your table setting. 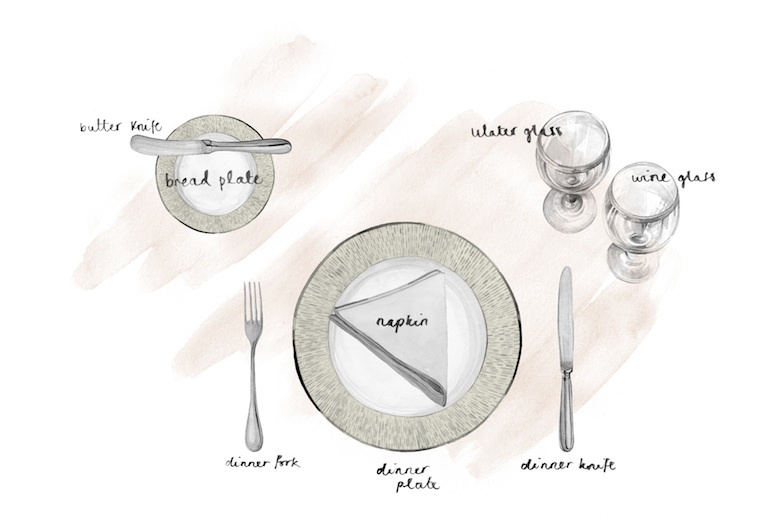 – The distance of your knife to your plate on your is the deciding factor for the spacing of each element of your table setting. – Your dinner knife is also a great indicator for placing your glasses. Your water glass should be placed directly above it in your table setting with any other glasses being placed to its right. – Glasses should always be placed largest to smallest from back to front. 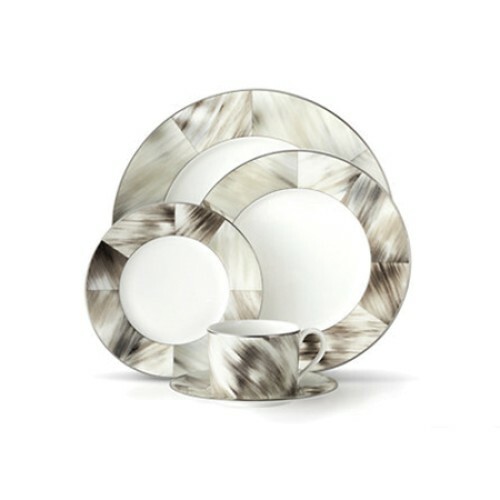 Glassware sets will differ but this is standard for most table setting designs. – In general, a side or bread plate is usually 15 to 18 centimetres, a salad or dessert plate is 22 to 25 centimetres, a dinner plate is 27 to 28 centimetres and a charger or service plate is 31 to 33 centimetres. 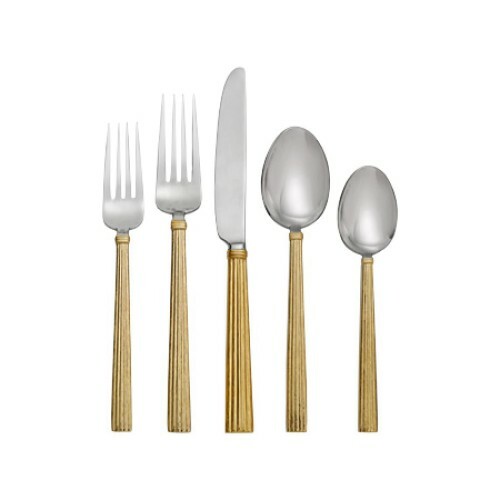 See our Guide To Luxury Dining Room Furniture for more tips specific on dining room styling. They say breakfast is the most important meal of the day but too often it consists of a quick sip of something warming and a slice of toast as we rush out the door to work. Recapture the potential of breakfast by taking time out to properly enjoy your food by creating a pretty breakfast table setting. This arrangement is for a more formal breakfast (imagine a Continental or a full English breakfast) so it includes many elements of any other meal of the day. Start with a dinner plate and flank with a dinner fork, knife and dessert spoon. Even though you might be serving a hot meal, it’s nice to include a bowl for cereal as well – it’s a quintessential breakfast element and your guests might want a bit of both. 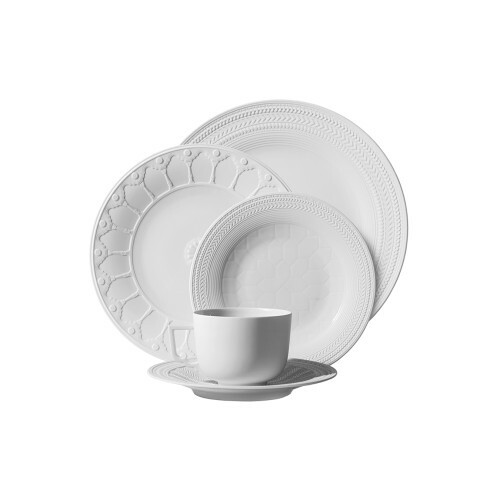 A bread plate and butter knife for toast, muffins or pastries is another item which should be included. Little individual jam or marmalade pots are a nice touch. A cup and saucer is mandatory for that early morning tea or coffee but be sure to include a juice and water glass as well. 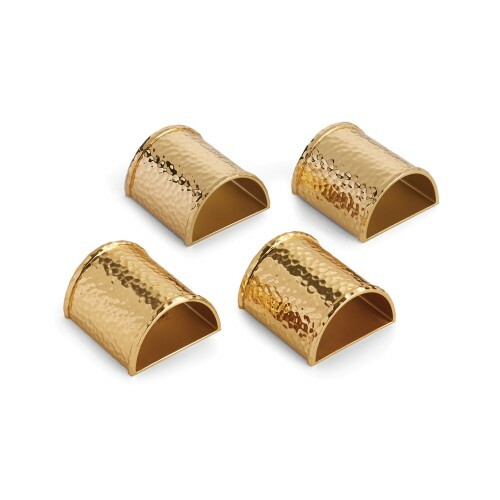 Breakfast napkins can be a little more casual – crisp white napkins are always chic but don’t be scared to opt for a patterned style which can be accessorised with fun napkin rings. 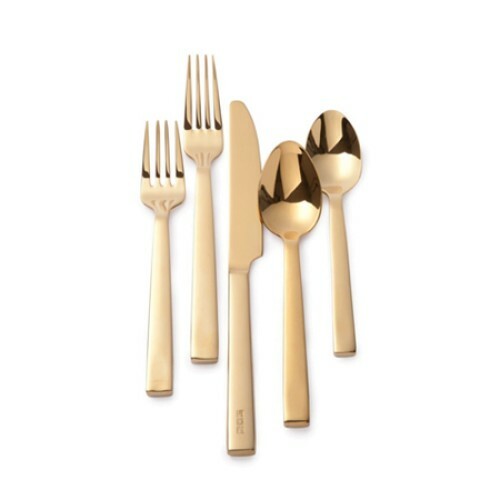 Like breakfast, lunch has the basic table setting foundation – dinner plate, fork and knife. 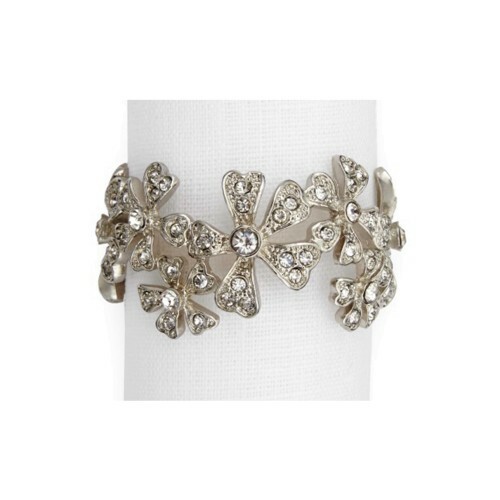 Switch out the cup and saucer for a stemmed water and wine glass for an elegant look. 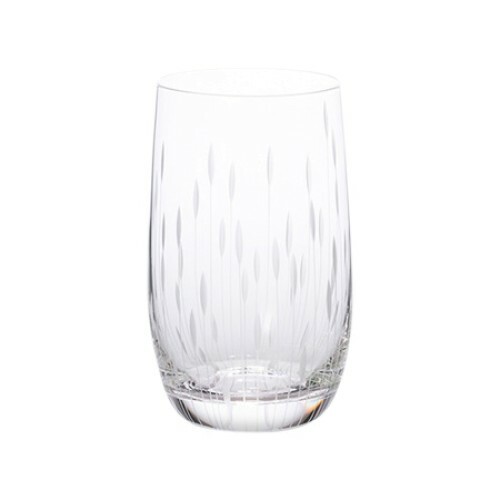 If wine isn’t being served, tall tumblers also work well if you want an informal look. 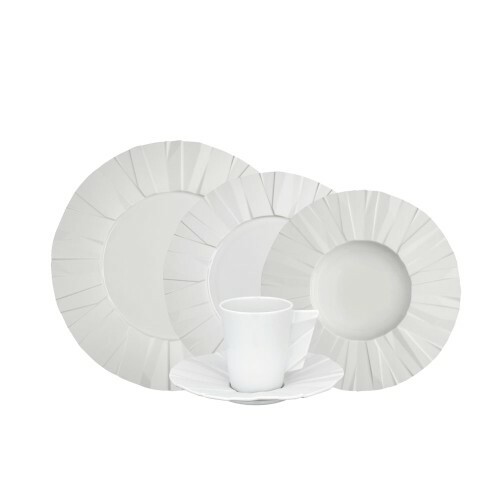 Without the breakfast bowl, napkins can now be placed on the plate which breaks up the whiteness of the plate. 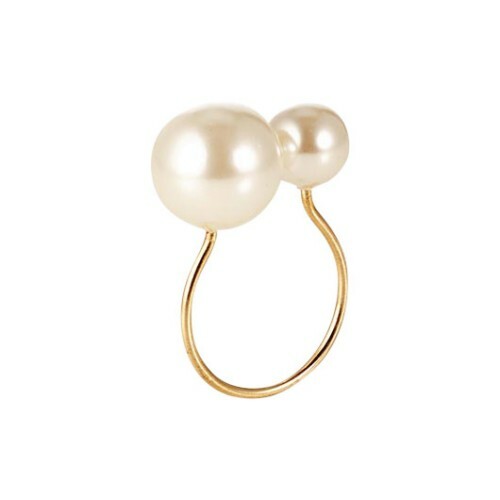 Again, these can be a little more informal unless it’s a special occasion like a luncheon. If soup is being served, however, include a soup bowl and spoon – this spoon should be placed to the right of the dinner knife. 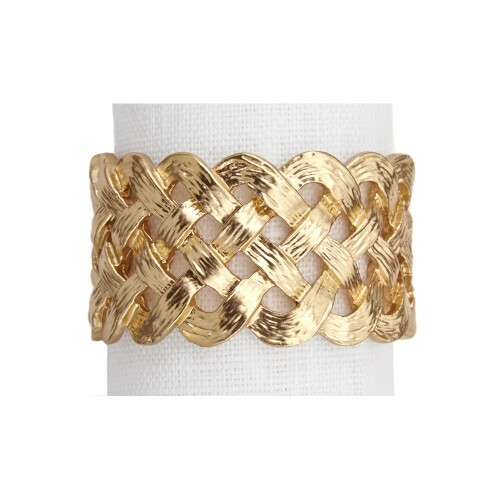 Dinner is where things can get a little trickier. Extra courses equal extra crockery (like the side/salad plate shown here) and, more importantly, extra silverware which is often where people get confused. Shown in the top right of this setting is the correct ordering for glassware. 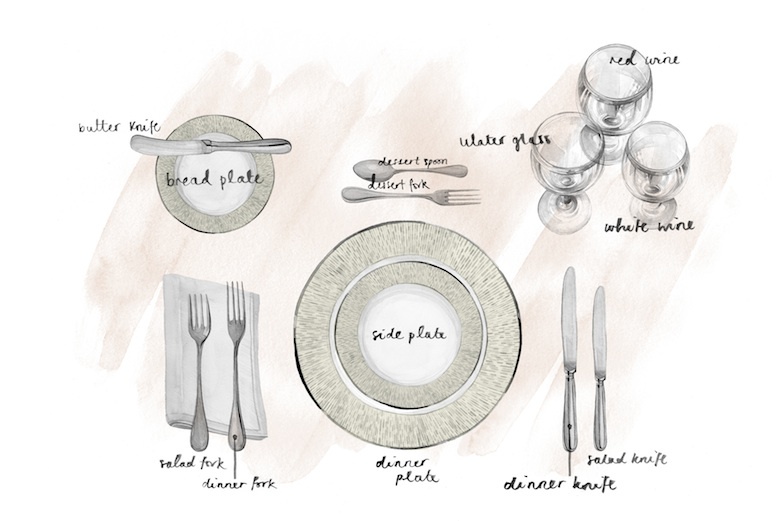 Larger red wine glasses go to the back, smaller white wine glasses are placed in front of and the water glass should be closest to the table setting, just above the dinner knife. Since dinner tables are usually more formal than breakfast or lunch, opt for crisp white napkins over motif or printed ones and keep them tucked under the forks for a tidy finish. 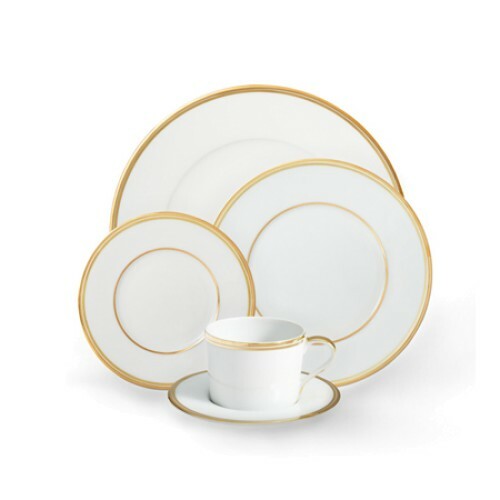 The most special events call for the most elegant of formal settings and the utmost care should be taken to ensure that your table is set correctly. 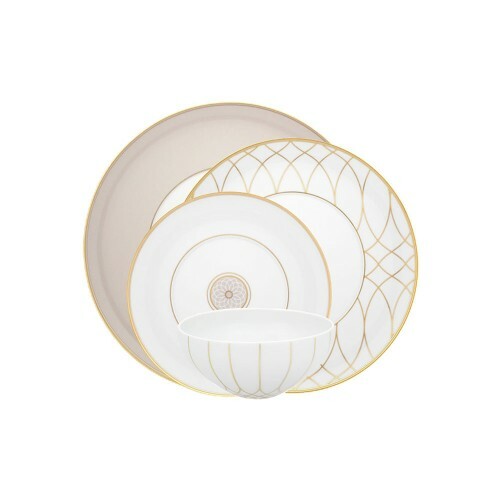 The foundation of a formal setting (and what sets it apart from a typical dinner setting) is the presence of a charger – a decorative base plate on which all the other service plates rest. Because it is purely for decorative purposes, a charger is often more elaborately designed than its practical counterparts, making it a luxurious addition to your table. 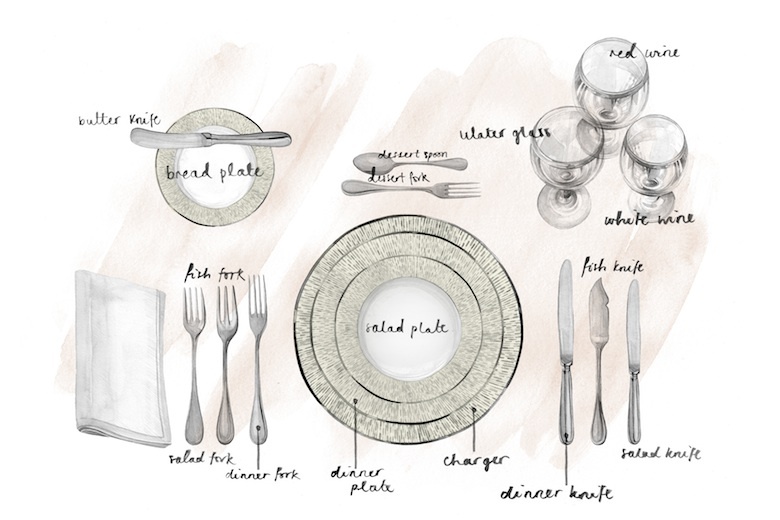 The same rule of thumb for silverware placement should be applied to formal settings, however many courses are being served. 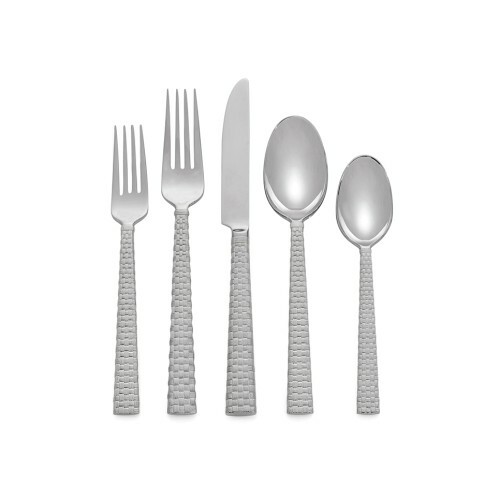 This setting shows three cutlery settings for a starter course, fish course and main course – with utensils for the early dishes being placed on the outside. Napkins should be placed to the left of the forks to allow each diner or a server to easily place napkins on laps. – Don’t pick up your cutlery or start eating until everyone at the table has been served. This doesn’t apply to tables of 8 or more. – Don’t put your elbows on the table. – Do ask to be passed a dish or condiment – never reach over anyone or their plate. But always offer to another guest first. – If you need to leave the table, always excuse yourself. 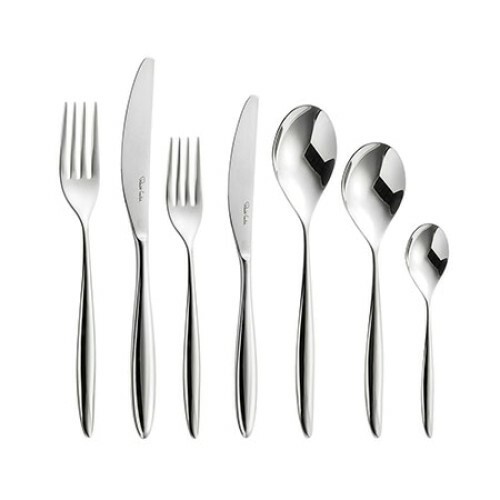 – Place your cutlery together with the blade and tines facing upwards to 12 o’clock to signify that you are finished eating.